We like how Lytics’ new Journey Reporting product helps us visualize how customers move through the marketing journey, and we see the potential in both analyzing how our content is performing and creating new customer segments around content affinity. Over the past several years, companies have increasingly adopted content marketing – that is, connecting with their customers through the sharing of educational information – versus leading with just a sales pitch. Challenge is, content marketers have not always known which content (blog posts, videos, case studies, how-to documents) performs best with each customer. In response to the demand for better technology to support the content marketing movement, Lytics, a personalized-marketing technology provider, announces the first Content Affinity Engine. Lytics Content Affinity Engine is a web-based product that uses machine learning to help companies determine which content (blog posts, videos, etc.) is performing well, its features (its topics and imagery) and which customers the content appeals to. Lytics also released Journey Reporting, a dashboard that both visualizes trends in companies’ customer data – how people interact with the companies’ web sites, email marketing, apps, commerce, etc. – and depicts how customers move through the engagement journey. With Lytics Content Affinity Engine, companies can better direct their content marketing resources (people and budget) to content that is in demand, as well as automate the distribution of high-performing content to individual customers. Imagine being an athletic-apparel retailer and having the ability to see what hundreds of educational topics your blog covers (e.g., yoga poses, whole-foods diets, managing muscle pain) and looking up an individual customer to determine their affinity for those topics (e.g., “Sarah” likes posts about yoga). And what if you could then use a segment of those customers (“People Who Like Yoga Content” and “Prefer Mobile-App Interactions” and seem “Ready to Buy”) in your marketing-technology tools to personalize each interaction with individual customers. With Lytics’ many integrations with top marketing-technology vendors, a company can also serve up specific pieces of content to individuals who like that content via e-mail marketing, web-site content management systems, online advertising, mobile-app push notifications and more. 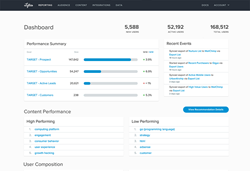 In addition to the release of Content Affinity Engine, Lytics announced Journey Reporting, a web-based dashboard that visualizes how customers move through their journeys with a company’s brand. Prior to Lytics Journey Reporting, companies could integrate all of their customer data – purchasing, email/web-site/app usage, customer service tickets – and export segments of different audiences to marketing tools, but companies did not have a convenient way to examine the customer data and spot trends. Now, in Lytics Journey Reporting dashboard, companies can monitor how their customer base moves through the marketing funnel – from, say, cold lead to happy customer – and how they are behaving along the way (e.g., high/low usage, binge user, unlikely to re-engage, etc.). Both Lytics Content Affinity Engine and Lytics Journey Reporting are built on top of Lytics Customer Data Platform (CDP), which the company launched in October 2014. Lytics Customer Data Platform helps companies deliver on the promise of one-to-one, personalized marketing by creating rich profiles of individual customers and segments of customer groups based on their behaviors and preferences across many interactions with a brand. While Lytics Journey Reporting is simply a better visualization of this customer data, Lytics Content Affinity Engine is a technological breakthrough in the marketing-technology industry. To build the Engine, Lytics created technology that crawls a company’s trove of content – e.g., blog posts, videos, product imagery – automatically classifies it and then determines which customers like it. Now, a company can request that their content marketing teams create more content that actually performs well and deliver specific pieces automatically to those consumers who care for it. Both Lytics Content Affinity Engine and Lytics Journey Reporting products are available to order. Screenshots are available at https://drive.google.com/open?id=0B4pLgmP38le1NzdaZWljbGYzSjA. For more information, please visit http://www.getlytics.com/products/reporting. Lytics helps enterprises automate personalized marketing experiences through the industry’s most advanced Customer Data Platform (CDP). Popular retailing, media, consumer goods, banking, and tech brands use Lytics to execute one-to-one marketing programs that their customers welcome. Lytics is headquartered in Portland, Ore. Learn more at http://www.getlytics.com.